Posted By Edward, 4th Jul 2017. 4 Minute Read. So why are white bathrooms so popular? How you can incorporate the white bathroom look in your home? One of the first questions you'll ask yourself when planning a new bathroom is what colour scheme to choose. Popular bathroom colour ideas include grey and neutral however the most popular colour of them all is actually... white. White bathrooms are a style that will never go out of fashion. The bright and timeless appeal of this colour is a popular choice because a white bathroom won't look dated in a few years time. White is also an excellent choice if you are preparing your house for the rental or property market because white is a colour that will provide a blank canvas for potential buyers and renters to style up themselves. In this expert guide from online bathroom retailer Victorian Plumbing we take a closer look at what makes white bathrooms so popular and then show you the best white bathroom decorating ideas to help incorporate this beautiful look into your own home. The universal template that a white bathroom creates is perfect for both a modern or traditionally styled bathroom. This hue lends itself perfectly to both contrasting bathroom styles and the good news is that there is a huge amount of modern and traditional white bathroom fixtures to choose from, so you're sure to find something that matches the look and feel you're aiming for. The colour white is good at reflecting light which can make a space feel bigger and more open. This is why white is a popular colour with small bathrooms; if you’re currently planning a cloakroom or en suite bathroom then why not think about going for a small white bathroom? Another reason why white bathrooms are so fashionable is that you're not tied down to the way your bathroom is styled from day one. What I mean by this is that you can forever change the look or feel of your white bathroom by changing your accessories and soft furnishings. Something as simple as changing the colour of your towels can significantly change the look of a white bathroom. 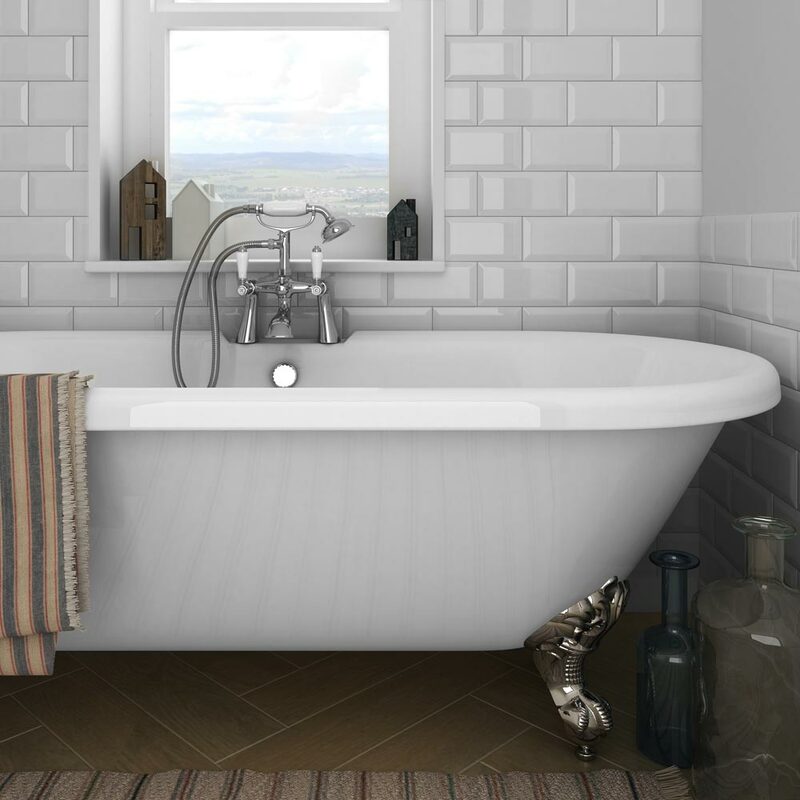 If you're thinking white walls for your new bathroom then a great choice is white metro tiles. Metro tiles are a fool-proof way of adding a stylish and sophisticated element to your bathroom design and another plus point is that they work equally well in either a modern or traditional setting. As well as white metro tiles, there is a large range of white bathroom tiles to choose from like white stone or marble effect tiles. 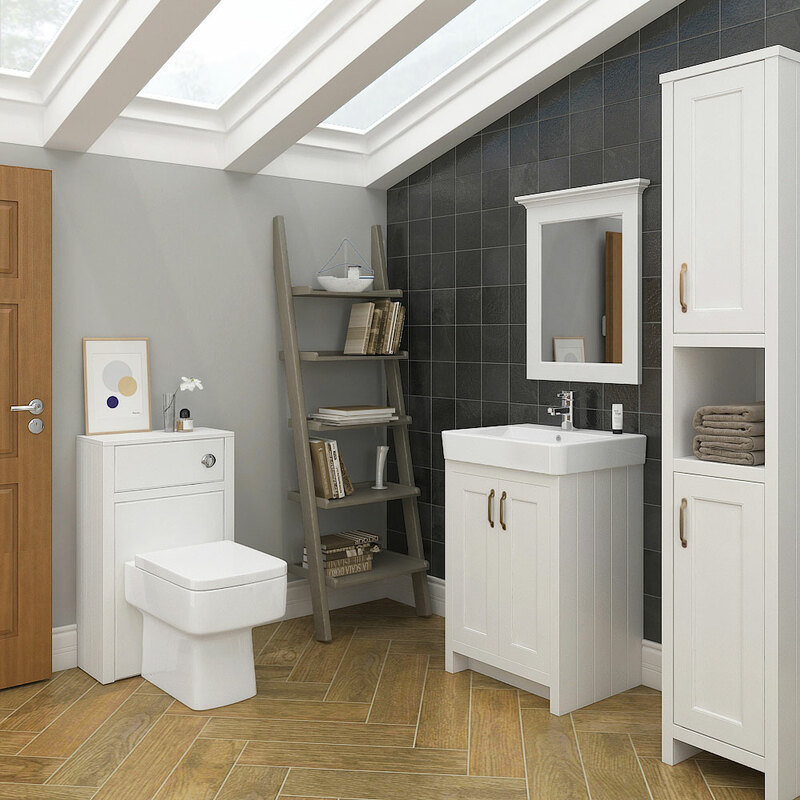 When it comes to white bathroom furniture you will find yourself spoilt for choice. 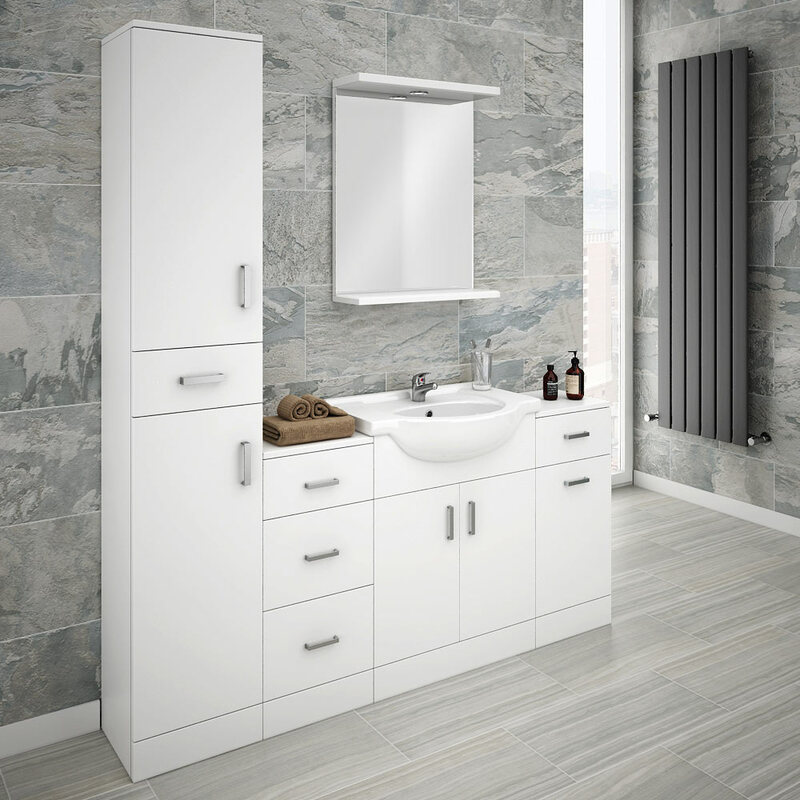 There is more white bathroom furniture on the market in the UK than any other colour so there will be plenty of beautiful examples to choose from. Two white bathroom furniture ranges worth taking a look at are the Chatsworth and Cove collections. The Chatsworth collection is perfect for any traditionally styled bathroom while the Cove range is great for nailing the contemporary bathroom look. One particular look that's creating a real buzz in the world of bathroom design right now is the concept of styling a white bathroom with plain white walls, white bathroom cabinets, and then throwing in a splash of colour with a pattern tiled floor. 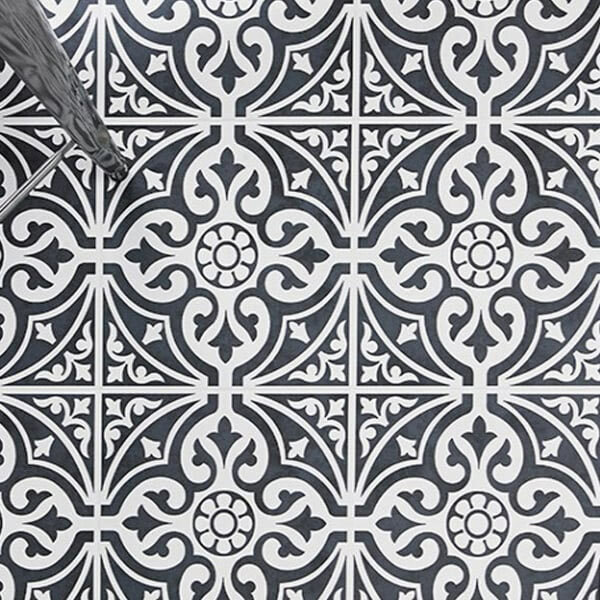 Our Kingsbridge patterned floor tiles are perfect for achieving this dramatic bang-on-trend look. Nice finishing touches for a white bathroom could include a white radiator or heated towel rail. 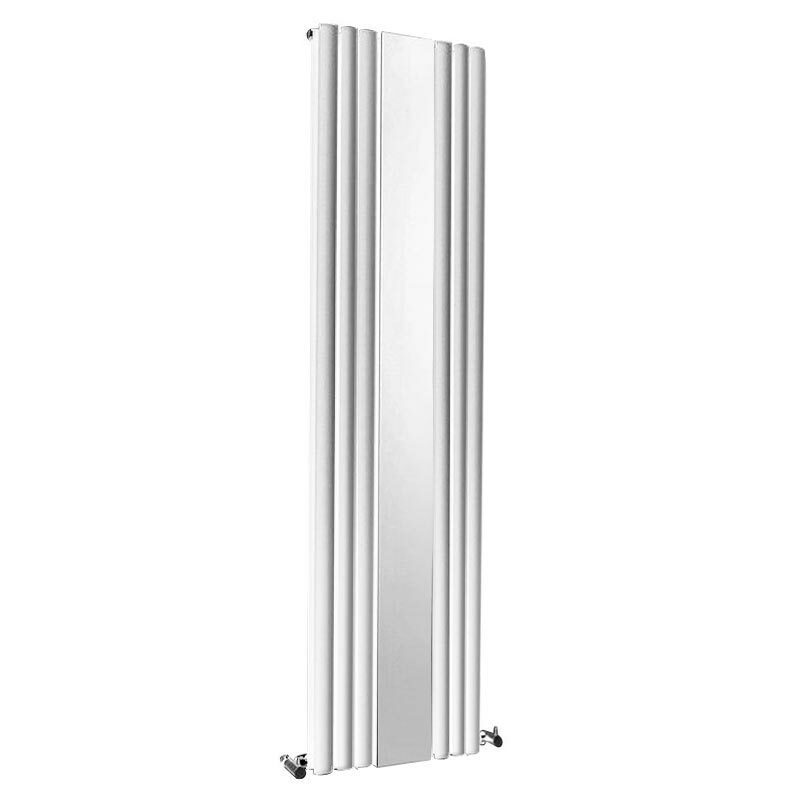 The Metro designer radiator with it's integrated mirror is a great white bathroom idea that would be a nice addition to any modern bathroom design. If you're planning a more traditional setting then a period inspired white heated towel rail like the Savoy would complement your new bathroom. Another way of continuing the white bathroom theme would be to go for white bathroom taps. 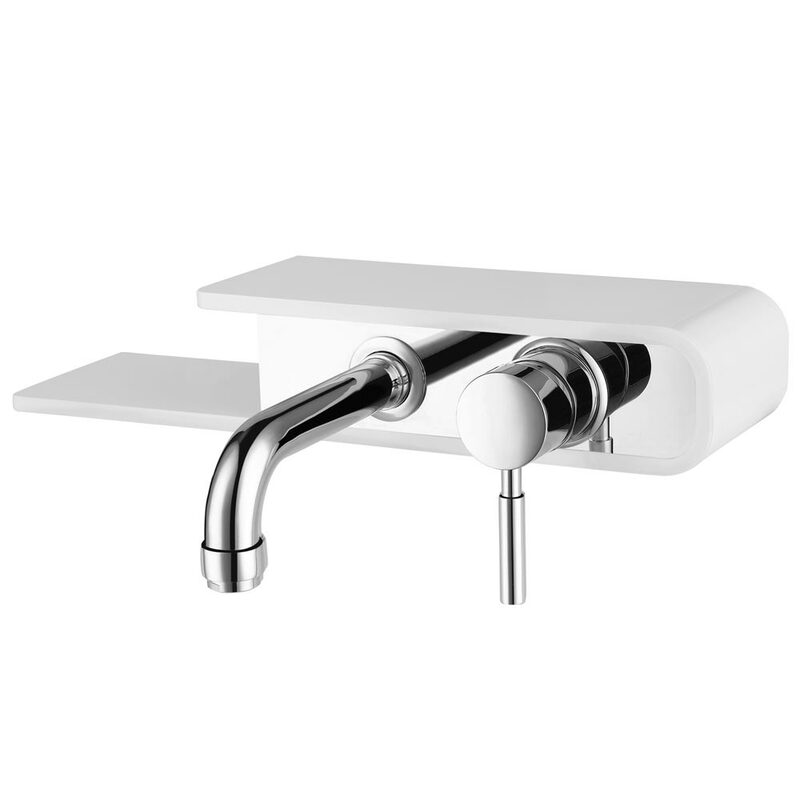 A white tap that could work well in either a large or small bathroom is the Vesta wall mounted basin tap. A wall mounted tap frees up space on your basin or counter top and the Vesta in particular has an integrated shelf for keeping your bottles and potions to hand when in the bathroom. As mentioned before, a white bathroom can be dramatically altered by simply adding colourful decoration. Soft furnishing, accessories and bathroom pictures are a brilliant way of adding a splash of colour to your bathroom. And then, if you feel your bathroom needs freshening up in the future all you have to do change the colour of your bathroom decoration! I really hope you have enjoyed reading our white bathroom ideas. 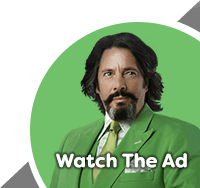 If you would like more inspiration then take a look at the VP Facebook, Twitter, Pinterest, Instagram and Google+ pages. Want to see an example of a white customer bathroom. Take a look at Danielle's white ensuite bathroom that she shared with us recently. Thank you for reading and good luck with your white bathroom. Discover the secrets to designing a beautiful contemporary bathroom.